If the Chiefs are going to crawl back into the AFC West race and have a respectable season, they’ll need to take advantage of a winnable game on Sunday. The Chiefs’ next opponent, the Tampa Bay Buccaneers, have won only one game this season, and have struggled on both offense and defense. 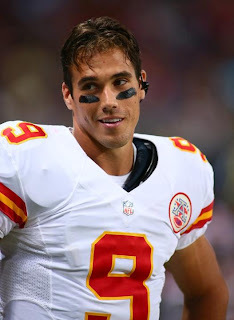 The biggest news for the Chiefs is that the team will have a new quarterback – Brady Quinn gets his first start in Kansas City after Matt Cassel’s concussion injury has ruled him out for Sunday. The Chiefs have run the ball extremely well this season, as Jamaal Charles has rushed for a league-leading 551 yards and also tallied 118 yards receiving. Tampa Bay has only allowed 74 yards-per-game on the ground this year, so this one may come down to whether or not Kansas City can get Charles going. Tampa Bay has struggled offensively, averaging only 276 yards per game as a unit. Josh Freeman has been average at best under center this season, throwing for a pedestrian 790 yards with five touchdowns and four interceptions. The Bucs haven’t gotten their ground game going as well, as the team’s top two backs, Doug Martin and Legarrette Blount are only averaging 3.5 yards per carry. Kansas City’s defense looked very impressive against the Ravens last week, limiting Baltimore to only nine points despite often defending a short field due to Cassel’s turnovers. If the Chiefs defense continues to play well, a struggling Tampa Bay offense may have no answer. Both the Chiefs and the Bucs are hard to get a read on, as the two teams have been incredibly inconsistent on both sides of the ball this year. Tampa Bay is coming off a bye week, while Kansas City is coming off an incredibly frustrating loss. Still, the Bucs’ offense has really struggled this year, and it appears that the Chiefs defense is coming into its own. If Brady Quinn can protect the football and make a couple of plays, Kansas City will have a good shot to pick up its second win of the year. Tampa Bay has won the last three meetings in this series by a combined 13 points. Game time is Sunday at 12:00 p.m.